Cities Connection Project | FIVE HOUSES. BARBENGO. The “5 houses in Barbengo” are located to the east of a small mountain called Collina d’oro or Golden Hill, not far from the old centre of the village of Barbengo (near Lu- gano), on land that was once a vineyard and still has the terraces typical of viticulture. The project of the 5 houses took shape. 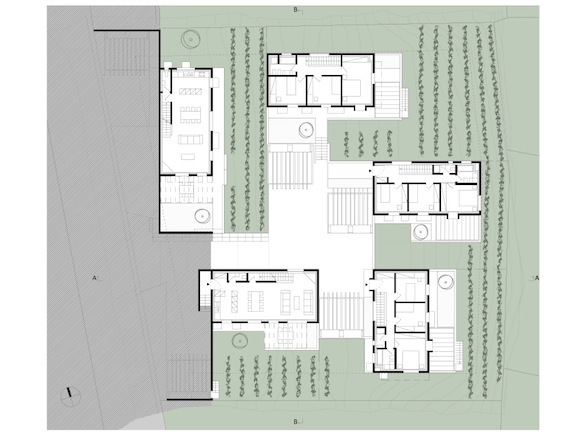 The unifying theme is that of the wall, a line that defines the houses and external areas and connects the buildings, making them appear as a single body. The buildings are placed in the terrain at different depths, following the lines of the original terraces and arranged around an empty central space for common use, such as in agricultural facilities of the past. The materials cho- sen are inspired by those of traditional architecture, with concrete used as stone, windows made of wood and a tiled roof. The façades are made of fair-faced concrete, moulded with horizontal planks of wood. 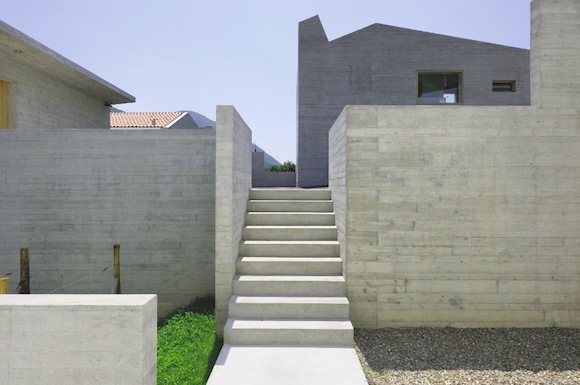 Two of the façades of each house are painted white: a colour that brings out the shadows created by the irregular surface of the concrete and creating a basic distinction between the main walls of the structural system and the “secondary” walls. The materials used for the interior are wood for the floor- ing, windows and doors, and the sloping roof slab made of load-bearing wooden caissons by Lignatur and left exposed, and concrete for the flooring on the ground- floor, which continues in a homogeneous manner to the external paving. Any external spaces not used for patios or terraces are once again planted with vines and, thus, returned to the original use of the land.All 5 houses are low-energy (Minergy) houses equipped with a heat pump for heating and solar panels to supply hot water.